I have become addicted to Matcha Green Tea after noticing the amazing energy boost it gives me, minus the nervousness associated with caffeine. It seems to improve my sense of well-being and ability to cope with life's challenges, and I notice this effect (or rather the lack of it) whenever I forget to consume my daily dose of a teaspoon. Also, my digestive challenges have gone away and I'm enjoying my food again without having to pay the price in stomach cramps and chest pressure. This brand of Ceremonial Grade Matcha is of the highest quality, produced in accordance with the best practices for this class of product. It is one of the smoothest tasting Matcha powders I've ever tried. I don't actually enjoy the taste of green tea as a beverage but I do like it added to my smoothie or straight into a tub of yoghurt or Bifidus with a little lemon juice to increase the Matcha's absorption rate. Taken this way, the flavour is very green and very fresh. 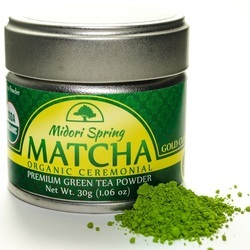 The tin of Midori Spring Matcha (Gold Class) I received, to enable me to prepare this review, was fully sealed with a pull-up metal lid and contained 30 grams (just over 1 ounce) of teal-green Matcha powder, fine enough that it floats in the air when handled carelessly. If you think the price is steep for such small quantities, keep in mind that this is a food supplement rather than just a beverage. This brand of Matcha is grown in Japan, in the shade, and the best-before date, in my case, is nine months away. Once opened, it is suggested that it should be kept refrigerated. If you are not familiar with the benefits of green tea, a simple search will provide all the answers. In a nutshell, it is a very powerful antioxidant, which helps fight many modern-day health issues including heart disease, inflammation and various forms of cancer. According to the claims, the three main benefits are: 1) Fat burning; 2) Energy boost; 3) Relaxing action. Although seemingly contradictory, these three effects were noticeable to me within a very few days of adding Matcha green tea to my diet. My naturally nervous nature is very sensitive to any mood altering agent, but it seems to thrive on Matcha. My daily exercise sessions are easier to do, and in general my focus has improved and I'm experiencing a sort of calm energy that lasts all day. My sleep quality has also improved. If you haven't tried Matcha yet, this product might be a very good introduction because of its deliciously mild taste. 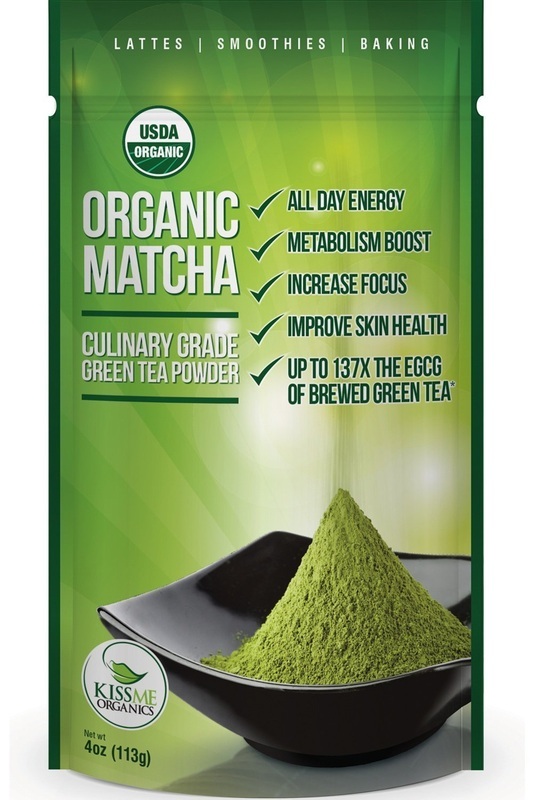 When I tried my first Matcha green tea powder, I was amazed at the positive effect it had on my general well-being but I cannot say that I enjoyed the flavour. Even in tea-bag form, green tea is a taste I have not yet acquired. Still, I bought more Matcha and now I make sure to have it always on hand to add to my smoothies because I love the energy boost it gives me, without the jittery side effects of other kinds of caffeine-type stimulants. This brand of Matcha is different in that it is Ceremonial Grade. It means that it is the best-tasting, top-quality Matcha, and produced especially to be consumed as a beverage. I have tried it that way, but to be honest, and please forgive the obvious pun, it is not my cup of tea. Instead I add a scant teaspoonful to my breakfast bifidus or yoghurt, and have discovered that I actually love the taste in that combination. It's hard to describe but it is green, herby, mild and very fresh. 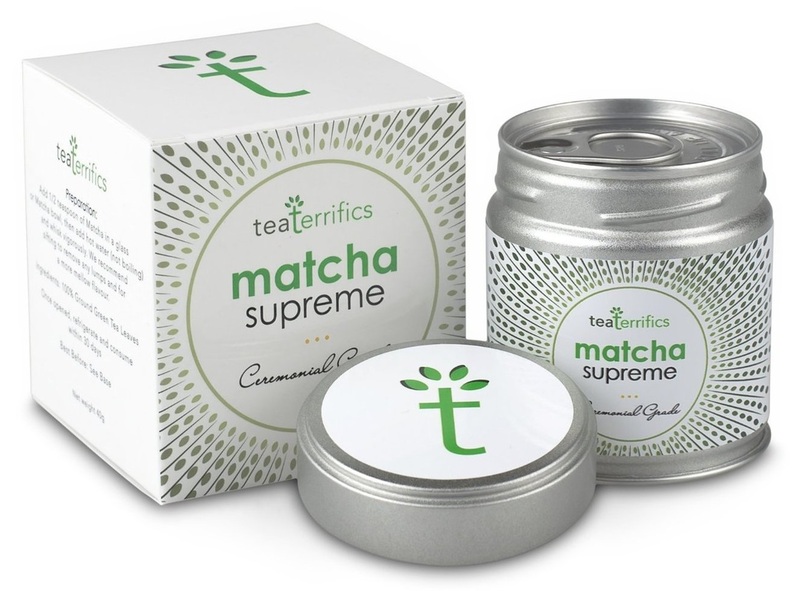 The jar of TeaTerrifics I received to prepare this review contains 40 grams of powdered Matcha so fine that the first time I opened the jar, a little cloud of dust floated in the air. For those who are interested, this brand of Matcha is grown in Japan and carries a best-before date, in my case nine months away. The tin is really pretty and a very decorative thing to have sitting on a shelf, however, it is suggested that, once opened, it should be kept refrigerated and its contents consumed within 30 days. Since it is fairly small, and I use some every day, I'm sure my supply will be finished well before then! If you are not familiar with the benefits of green tea, a simple search will enlighten you, but basically it is a very powerful antioxidant, which helps fight many modern-day health issues including heart disease and various forms of cancer. According to the claims, the three main benefits are: 1) Fat burning. 2) Energy boost. 3) Relaxing action. Although seemingly contradictory, these three effects were noticeable to me within a few days of adding Matcha green tea to my diet. My naturally nervous nature is very sensitive to any mood altering agent, but it seems to thrive on Matcha. My daily exercise sessions are easier to do, and in general I have better focus and a sort of calm energy that lasts all day. My sleep quality has also improved. If you haven't tried Matcha yet, this product might be a very good introduction because of its deliciously mild taste. It's not cheap, but the price has come down a lot lately, and I think it is currently on sale. My husband drinks green tea. I don't care for it. When I was asked to evaluate this green tea-based product, I was sceptical to say the least. Four weeks into the trial period, I have been pleasantly surprised by the very different way in which this supplement acts on my system. I was familiar with all the benefits of green tea, but I avoided it because of the bitter taste and the jitters it seemed to cause me. Matcha Green Tea Powder is a very different product, as I learnt. It is made from leaves grown in the shade, and it is not fermented. After purchase, Kiss Me Organics will send you an email with a link to download a PDF recipe book which also includes a pretty comprehensive explanation of Matcha green tea and its beneficial properties. Mainly, it is a very powerful antioxydant, assisting in the fight against a host of modern-day illnesses including heart disease and many forms of cancer. According to the claims, the three main benefits are: 1) Fat burning. 2) Energy boost. 3) Relaxing action. It would seem that these three cannot possibly be achieved by the same supplement, as they are somewhat contradictory. So I was very curious to see how this would work for me because the menopause has left me with a tendency to nervousness and I am very sensitive to anything that causes mood alterations. I started my trial of the Matcha Green Tea Powder one week before some minor but delicate surgery, just as my anxiety was building. It turned out to be a very stressful time for other reasons as well, and normally this would have triggered a weight gain and poor sleep. To my surprise, the Matcha showed some effect almost immediately. I noticed that my daily exercise session was a lot easier to do, and in general I had better focus and a sort of calm energy that took me to the end of the day. I also slept better. The recipes in the book are designed to make the most of the sensational green colour, but it's possible to add the Matcha to whatever you eat now, without making any dramatic alterations. I started with half a teaspoon in a protein shake, so the taste was covered up by whatever fruit I was using. Some days, I added the powder to a soup, casserole, or other composite dish. Easy and painless. So result-wise, my experience is that all three claims have been met. I am enjoying having more energy and focus throughout the day, sleeping soundly at night, and have even lost three pounds, despite having added a calorie-rich meal to my daily diet (the protein shake). In the past, anytime I dared to eat anything for lunch, I would see a weight gain the very next day! I'm now going to order more Matcha because this supplement is really working for us. "Funky acacia furls top my fence"